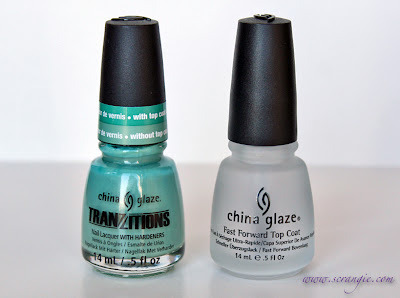 China Glaze's Tranzitions collection is a set of six very interesting polishes. They're not like ordinary polish. They're one color when you apply them, but adding a coat of topcoat changes them into a different color. Hence the name Tranzitions. China Glaze recommends their Fast Forward topcoat (which is what I'm using in these swatches), but any topcoat will trigger the color-change effect. 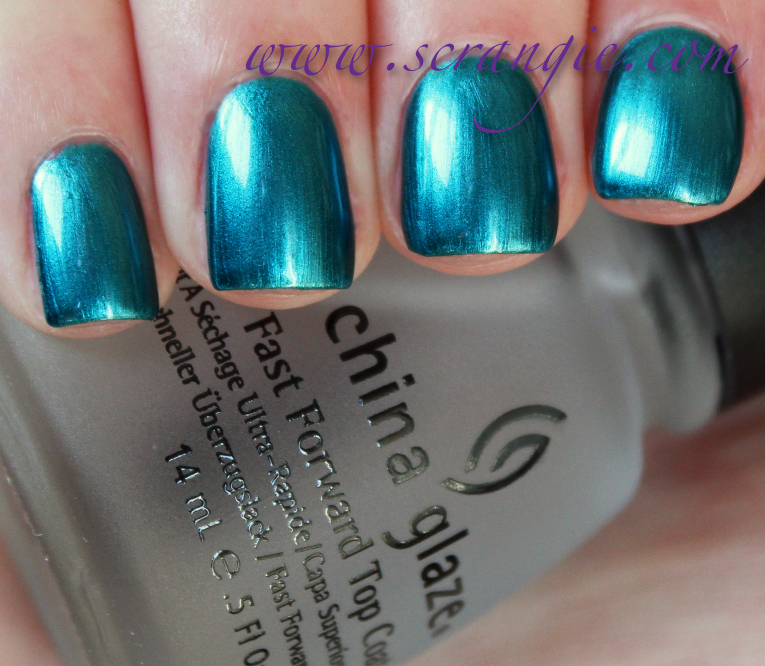 China Glaze Tranzitions in Altered Reality. This is a frosty, metallic and slightly duochrome medium teal. The main color is a blue-teal and it flashes a deeper green-teal at the edges. China Glaze Tranzitions in Altered Reality with topcoat. With topcoat, it becomes a darker, more blue type of teal. This one had the least dramatic color change effect for me. 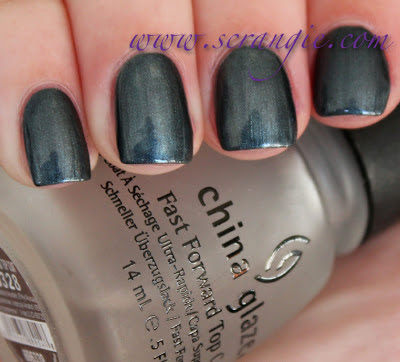 China Glaze Tranzitions in Duplicity. This one's a very pretty light teal-ish turquoise, almost more of a mint green. China Glaze Tranzitions in Duplicity with topcoat. With topcoat it becomes darker and more blue. China Glaze Tranzitions in Metallic Metamorphosis. A dark smoky charcoal-silver metallic. The shimmer particles look a bit rough and it dries nearly matte. This might be my favorite one pre-topcoat. China Glaze Tranzitions in Metallic Metamorphosis with topcoat. With topcoat, it darkens significantly and takes on a blue-green tint. 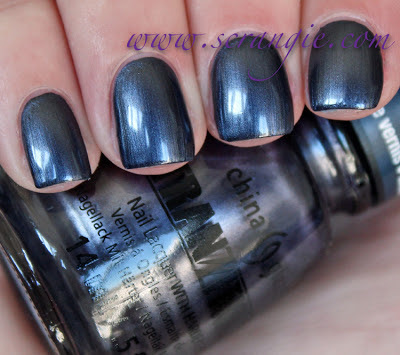 China Glaze Tranzitions in Modify Me with topcoat. ...becomes bright violet after topcoat. This is my favorite post-topcoat color. China Glaze Tranzitions in Shape Shifter. This starts out as a frosty, muted navy with purple tones. China Glaze Tranzitions in Shape Shifter with topcoat. 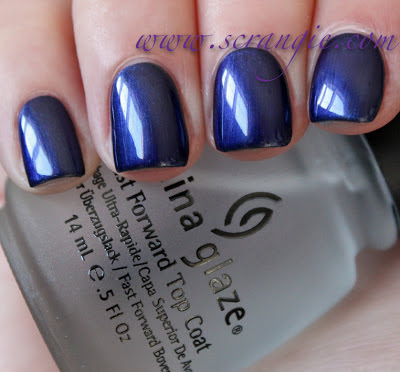 With topcoat, it becomes a gorgeous dark blue-toned purple shimmer. China Glaze Tranzitions in Split Perso-nail-ity. A medium mauve pink creme. China Glaze Tranzitions in Split Perso-nail-ity with topcoat. This is a pretty dramatic change. It becomes a saturated berry color! I found the formula on these to be problematic. The texture reminds me more of acrylic paint than it does of nail polish. It goes on with a slight drag and has a tendency to leave bald spots and make little lumps if I'm not careful. Three coats evens out the color, and that's what I used here. A little tricky, but manageable. I found the dry time to be long on all the colors. But let me tell you about what really bothered me about the formula: applying the topcoat. These polishes have little speckles of pigment in them (it's visible in a lot of the colors if you look closely), and they bleed when you apply topcoat. That's what gives them the color change. However, it doesn't just bleed on the nail. It bleeds into your topcoat and onto the brush. I would highly, highly recommend keeping a paper towel handy and wiping the brush before putting it back into your topcoat bottle each time. You will end up with tinted topcoat if you don't. The other problem with topcoat application is that it streaks. If you get the nail wet enough with topcoat, the streaks tend to disappear after a while. If your coat is too thin and dries too fast, the streaks will stay. Neither of those will be an issue if you use topcoat strictly for creating designs, which is what the intended use is. Streaks aren't visible when creating dots, for example, and you won't have tinted topcoat from using a dotting tool. So... These are a cool idea, for sure. Can't recall seeing any other polishes like these. If you take a thin nail art brush, or a dotting tool, or even a toothpick, you can draw cool designs with topcoat. The color change isn't as obvious on the darker colors, but it's dramatic on the lighter ones. If I was better at freehand nail art, I think I'd like these more. But, my hands are too shaky to have much success with freehand designs, and since I found the formula so strange and the topcoat bleeding problem annoying, I wasn't thrilled by these. I could use them for an easy funky french, and I tried out some dots which looked cool, but otherwise they're just a novelty for me and I don't see myself wanting to reach for them often. Thanks for the swatches! You have confirmed for me that I really do not need any of these. I prefer heat-sensitive colour-changing polishes for sure. OMGoodness the Modify me is such a beautiful Periwinkle, saying Periwinkle makes me happy inside!! Love it without the top coat, shame about the formula ......wondering if there is another similar colour out there??! I bought the color called Fade into Hue, which it's the closest. I hasn't heard anything about transitions so I opted for the regular polish. So glad I did! Essence has a few of these "Colour and Change" polishes in their product range since a few months - they work just like the China Glaze ones and they apply quite patchy, too. I think I will pass on all of these as well. There are so many more interesting shades out there right now. Yay you posted!! Haha. I keep checking all the time. Anyhoo, I skipper these. I didn't see much point. If I wanna do designs or dotting, I'll just do then with another polish istead of topcoat! :P. Barry M has a collection of polishes with the same concept called Chameleon. great post, scrangie! i'm not feeling these either, though i always enjoy reading your reviews--totally agree that the best application would be stamping or some kind of nail art--but don't think i'm that excited about the possiblity that i'd run right out and buy these ;) still, your nails look lovely! kind of cool yet kind of meh.. I think I will stick to the Barry M ones, a lot cheaper here in the UK and by the looks of things they work a hell of a lot better! such a shame. Great post - thanks for reinforcing that I really don't need these. I can't quite wrap my head around the point of them either. Surely you want to top coat your nails anyway? It would only be fun for nail art but even so I could easily do the same thing with 2 shades of polish? I bought Shape Shifter, and use it for a french manicure. I like it because the top coat on the tips help to not chip it, but that's all I use it for. It does have a funny formula. Nifty idea, but not super fantastic formula. Fabulous review! Since I almost never, ever go without a top coat (I like SHINY), these would be pretty pointless for me. Meh, maybe if I liked the colors better I'd pick one up for the novelty factor but these are all kinda boring. I'd almost rather than they sell a tinted top coat to use with a "matched" polish. I don't like the idea of bleeding speckles! I hate it when my top coat gets color in it, but I'd buy one that already had color! yea, Barry M has a few of these types of polishes, got myself one this past summer, it's an interesting idea, but really not anything special or outstanding. This collection seemed pretty pointless to me. You can't wear a topcoat unless you want the polish to change color, plus if I want a darker shade of the same color then I could just find the polish in that shade already. I think this collection was just them trying to profit from a failed formulation. I don't see any appeal in a polish changing color when you put on a topcoat. Love your blog though, thanks for posting! Carrie, there most certainly are other shades of periwinkle out there with regular standard formulas. 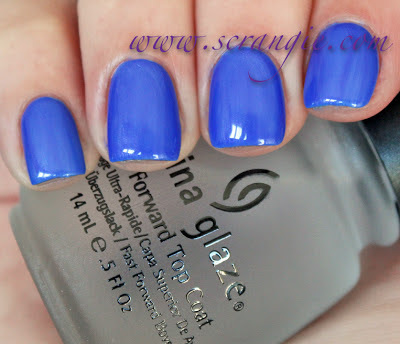 China Glaze has Secret Peri-Wink-Le, and Essie has several, try Lapis of Luxury. Nicole by OPI has one, and Orly has one. these colours are amazing! and china glaze is cruelty free, which I'm trying to become. Too bad I can't find them here. I happened here by chance and really adore this blog, I hope you will come and visit mine too. i am new into nail art loving. the outlook of this site is so cool and i love your style! Love your blog! I hope everything is okay in Scrangie-land.